Though Mountain Lion snuck onto the scene just this morning—big cats are sly like that—I’ve already discovered a few delightful details about the apps in Apple’s upcoming OS update for the Mac, thanks to editorial director Jason Snell’s hands on with the software. Here are five app changes I can’t wait to see come to my Mac this summer. The Safari toolbar has been reworked in Mountain Lion. 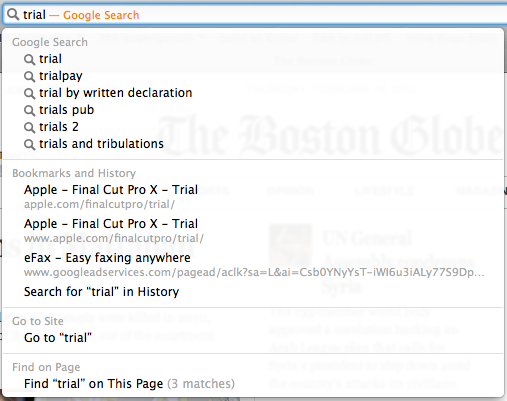 Safari gets a few nice tweaks in Mountain Lion, but none so nice as its new-and-improved search feature, now built directly into the URL bar. Like a Transformer, it can alter itself to fit your needs, whether you’re searching the Web, your bookmarks and history, or text on the page itself. You can also enter in a URL the good old-fasioned way, or type in a piece of text and have Safari return the top-rated search result for that phrase. Notifications will float on your screen as banners or pop-ups. Growl is great for the apps it supports, but I personally can’t wait to see Notification Center pop up on my Mac. Like iOS, you can customize in System Preferences which apps alert you; whether they have banners, pop-up dialogs, sounds, or nothing at all; how many alerts per app you’d like to see; and whether you want those apps to also feature badge notifications on their Dock icon. Combine this with a new two-finger gesture (swipe from the right edge of the trackpad inward) and an optional keyboard shortcut, and alerts for things like Mac App Store updates, and organizational bliss could soon be yours. While it’s great to have Notification Center on the Mac, some of us get far too many email messages each day to deal with a notification for every new message that comes in. Thankfully, Mail in Mountain Lion will offer an option for selective notifications within its preference pane: You can choose to receive notifications for new VIP messages, messages only sent from your contacts, or messages from one of your Smart Folders. 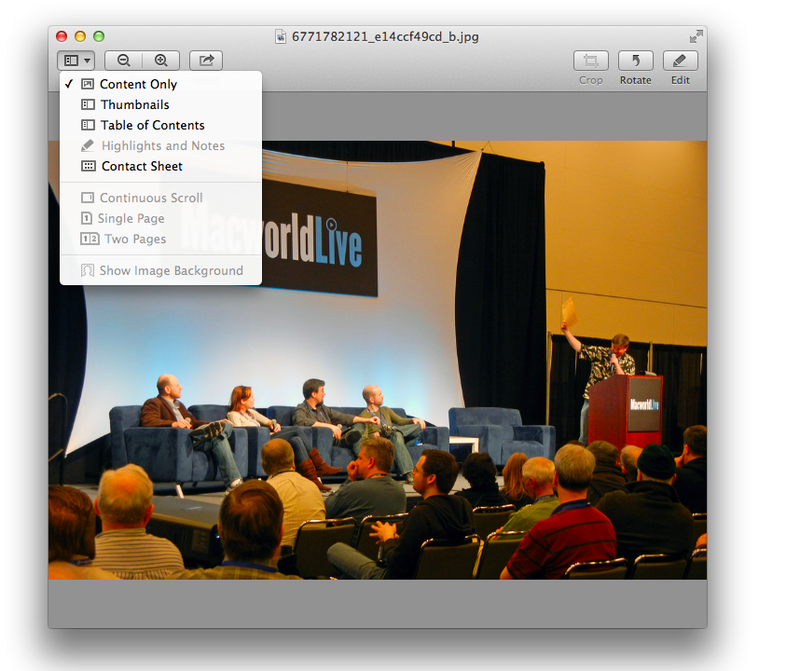 Preview's controls have been streamlined in Mountain Lion. I love Apple’s Preview application for doing quick edits on photos and annotating PDFs, but as the company piled more features into the program, everything started getting a little bit cluttered. In Mountain Lion, Preview turns down the visual noise without losing any vaunted features: The newly refined toolbar takes a cue from iPhoto and Apple's best iOS apps, simplifying tools behind single buttons. Preview's annotations have taken a chapter from iBooks on iOS. Crop, Rotate, and Edit are the three big options along the top bar for images, with Edit revealing a shelf below the main toolbar for all your corrective needs; PDFs receive Markup and Edit buttons, along with a search bar. On a PDF, Markup works similarly to Apple’s iBooks software: Highlight text by selecting it, then choose your color and whether you want to add a note. 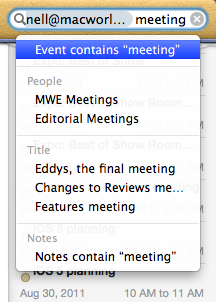 In Calendar on Mountain Lion, you can use multiple search tokens. In Mountain Lion, Apple’s iCal not only changes its name (to Calendar) and gets a nice interface alteration—it gains the Lion Finder’s search tokens, too. The updated app will not only automatically try and match your search words with events, organizers, locations, and notes, but you can also build multi-term searches, too. Need to see every Girl Scout meeting organized by the troop leader for the next year? No problem. You've (hopefully) sampled some of our veritable buffet of Mountain Lion coverage, now tell us: What features are you excited to see? Sound off in the comments. OS X Mountain Lion: A big cat for business?